STERLING, Va. (AP) — President Donald Trump is portraying the Islamic State group's ouster from its Syrian stronghold as a milestone in the U.S. fight against terrorism and a step toward a political transition and lasting peace in Syria. That assessment, in a statement released Saturday, runs counter to warnings in recent days from his national security aides that the militants remain fully capable of striking American interests. And there are no signs of an impending political transition, with Syrian President Bashar Assad's government newly strengthened. 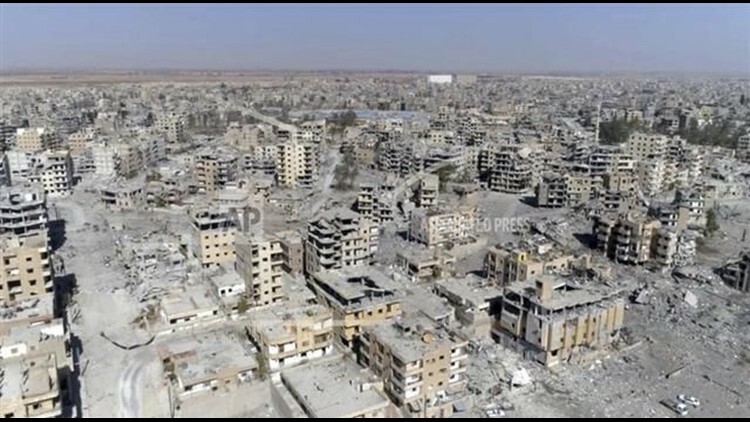 Kurdish-led forces on Friday declared victory in Raqqa, the extremists' self-declared capital, where they had terrorized the population for four years. Trump called it "a critical breakthrough in our worldwide campaign to defeat ISIS and its wicked ideology" and said "the end of the ISIS caliphate is in sight." He cited his efforts to empower U.S. military forces on the ground, and repeated his claim that more had been done to defeat the group in recent months "than in the past several years." The U.S. "will soon transition into a new phase" in Syria, Trump said, and offer support to local security forces. He said the U.S. will back diplomatic negotiations to end the violence, allow refugees to return safely home, and "yield a political transition that honors the will of the Syrian people." There is no indication, however, that a political transition will come any time soon. U.N.-led talks have shown no serious signs of picking up steam. The ouster of IS forces from Raqqa and other parts of Syria has overlapped with the increased influence of Iran and Russia in the country and a stronger hand for Assad, dimming prospects even further for the type of political solution the U.S. has long wanted to see. Most Raqqa residents fled long ago and are now scattered across refugee camps or abroad, and there is little for them to return to. The once vibrant metropolis on the Euphrates River has largely been reduced to rubble and is littered with land mines and booby traps. So far, the Trump administration has shown little appetite for longer-term engagement or involvement in nation-building in Iraq and Syria. While it will work to clear Raqqa of mines and restore basic services like water and electricity, Washington has made it evidence that it has no intention of playing the leading role in rebuilding the city. National security officials, including CIA director Mike Pompeo, have warned that just because IS has been evicted from Raqqa, it doesn't mean the group won't be able to carry out attacks against the United State. The U.S. military this past week estimated that 6,500 IS fighters remain in eastern Syria and western Iraq, many concentrated along the Euphrates River valley straddling the border. Those fighters pose an insurgent threat in both countries and an ideological threat globally.